Hamilton Stands - KB962 International Style Double Alto/Tenor Stand with two doubling pegs. International Style Double Alto/Tenor Stand with two doubling pegs. 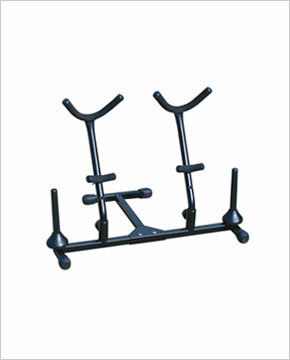 Robust twin alto and tenor sax stand. Provided with two clarinet/flute doubling pegs. Stable and secure with solidly built of square and round tubing. Can easily acccommodate two tenors, including large bell models. Easily removeable support posts and folding legs make for more compact traveling and storage. Metric receivers will accept other doubling pegs.